Size can be relative. In the case of Bosworth, Missouri, that’s exactly the case. With a population around 300, little things like a community garden can make a big difference. That said, FFA Advisor Melissa Eiserer saw an opportunity to better her community and she took it. After seeing information about Living to Serve (LTS) grants in the Department of Elementary and Secondary Education (DESE) announcements, Eiserer realized it would pair well with the school board’s desire to have a garden at their school. LTS grants provide an opportunity for FFA chapters to seek funding to support a variety of service projects through a competitive application process. Eiserer, who has taught at Bosworth for eight years, said she met two, if not three, of the areas with the garden project. “We harvested over 1,200 pounds of vegetables for our school and community with the 2018 project,” she said. Once the grant was secured, Bosworth FFA members—and the entire student body—went to work. Even with the whole school pitching in to start and maintain the garden, Bosworth still needed the community to help. After all, only 54 students attend Bosworth School. “Out of 18 high school kids total, we have 15 students in FFA,” Eiserer said. Bosworth has a small agriculture building, with a greenhouse next to it. Until the garden project, a double-wide trailer that had been used for preschool sat on a lot near it, but the school board moved the trailer to make way for the community garden project. Eiserer saw great potential in the spot where the trailer had sat. “The foundation was non-fertile soil, and I thought that would be awesome to put raised beds on because it was otherwise useless,” she said. That vision took flight in the form of a galvanized livestock tank container garden. Each class, preschool through 8thgrade, has a row of three container gardens. The lessons learned through the garden for each age are different. Preschoolers and and young ones use seed tape. The older kids get a hand in all that a garden entails. The first day, everybody built gardens. They came back the next day and planted the gardens. In addition to the container garden, they also planted a traditional garden so students could get experience with running a gas-powered tiller. From the weeding to the watering and finally, the harvest, Bosworth students get to grow their own food. It’s an experience many of them have never had. 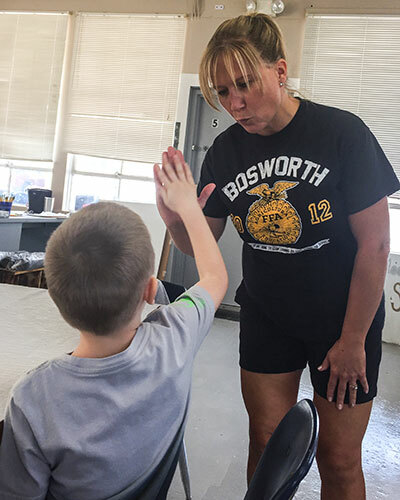 While Bosworth is a small town, most of its students are not from the farm. The community is involved, too. To get the goods out to the community,Eiserer uses social media and her front porch. “I put a post up on Facebook that the produce is available, and it’s all gone by the next morning,” she said. Some of the produce also goes to the local store using an honor system. The bounty was good for the garden’s first year—about 40 watermelons and 50 pie pumpkins among numerous other fruits and vegetables. Students are preserving some of the produce to be used in the school and community holiday program, which is a series of noon luncheons for the whole school. “We will provide fruit and vegetables out of the garden for the Christmas dinner this year,” Eiserer said. The community is benefiting from more than a homegrown holiday dinner. “Some of our older citizens that don’t garden anymore have been able to have some garden produce without driving the 20 miles into town,” she said. The kids are also learning a skill that they can use. After applying, and getting, the LTS grant twice, she said it does take some work. Eiserer used education resources from Missouri Farmers Care and the Missouri Soybean Association, which helped with the educational component of the application. In 2019, the community garden—and the LTS grant funding—will continue. “This year’s project will be for improvement with a watering system and expansion of different agriscience projects with gardening,” she said.